Do you have a WordPress site that’s running slow? That’s not good. There are many factors that can effect WordPress performance speed. These include: Web hosting, WordPress configuration, image size, dodgy plugins and external scripts to name a few. These can also effect your search engine page ranking. Below are a few tips, tricks and WordPress plugins I’ve picked up that keep my WordPress sites running at optimum performance. Your WordPress hosting will play a role in your overall WordPress performance speed. A good shared hosting provider will take extra measures to ensure your site is optimised for performance. But on shared hosting you are effectively sharing the same room with other customers. Therefore if one of your room mate’s site gets a lot of traffic, then it can have an impact on server performance, and of course your WordPress site. If you really want to remove that factor, then you may wish to choose managed WordPress hosting so you know that it’s just your site with no other interference. They should also offer automatic backups, WordPress updates and security features to keep your site safe. Assuming you have a WordPress site designed and built, you’ll first need to check you are running the latest version of your chosen WordPress theme. It’s also a good idea to update any plugins you currently have installed. And remove any unwanted or outdated versions too. This is good house-keeping. If you don’t know how to do this then contact a freelance web designer to help. Before you can start to understand what’s wrong with your site, you’ll need to use some external software to identify the areas that are causing issues. Head over to https://gtmetrix.com/ and enter your web address into the search field. Gtmetrix is a website optimisation checker and at the time of writing this article it’s free to use. Hit “Analyse” and wait for the results. It’s more than likely at this stage that your site will produce results that are in the 60-70% regions. 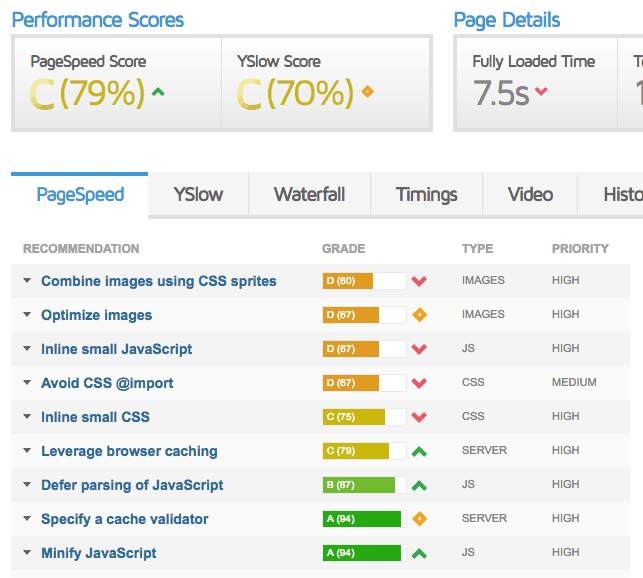 We’re aiming for both the PageSpeed Score and Yslow Score to be in the 90s. If you do have a score in the 90s, then well done. You can put your feet up! If not then read on. In the example shown here, you can see the page speed has various items shown in green and orange. It’s the ones in orange we need to worry about. If you wish, you can click on each of the areas to view the individual results. First thing is to head back to your WordPress admin panel and instal some backup software. Whenever you undertake any major changes to your site, it’s important to run a backup just in case something goes wrong. There are various great plugins to use such as BackupBuddy, and BackWPup. However I’ve used UpdraftPlus for many years and it works for me. 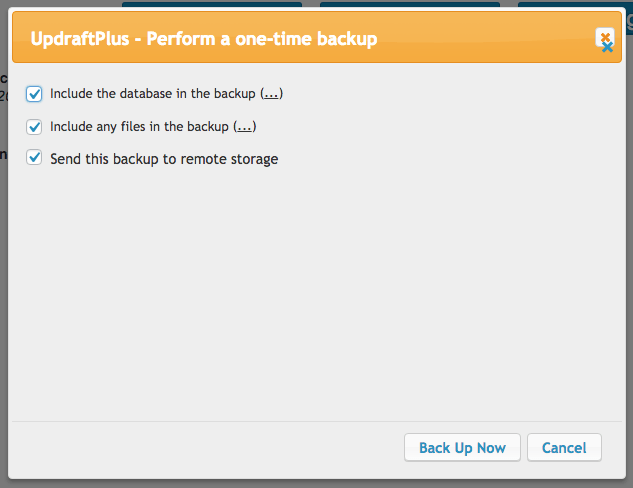 Assuming you have added UpdraftPlus, go to “Settings” in your WordPress sidebar and click on “UpdraftPlus Backups”. Click on the “Settings” tab and choose your remote storage option. 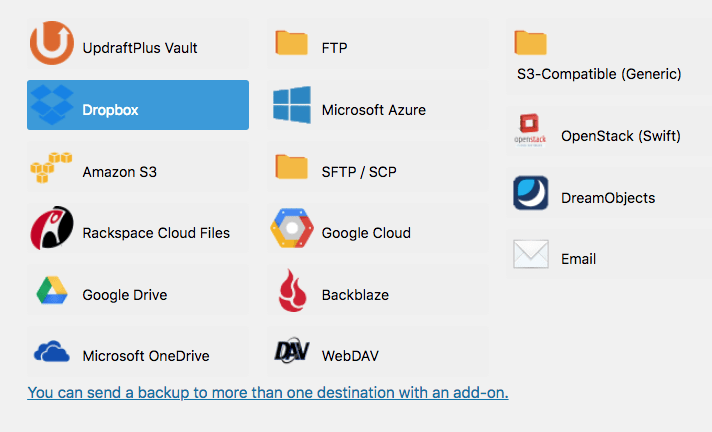 I use Dropbox but there are a number of other options including Google Drive, Amazon S3 and FTP. Go through the setup process (sign up to one of the backup options if necessary) and then you are good to go. Click on the “Current Status” tab and hit the “Back Up Now” button. Make sure all the options are ticked and click ”Back Up Now”. This will run the backup process which will take a few minutes depending on the size of your website. If your GTmetrix report says you need to serve scaled images, it means that some of the images on your site are bigger than they need to be. In general terms this means that when a page is loaded with a large image (eg. 2000 x 1500 pixels) you are telling the web browser to export it at maximum quality. This results in unnecessary file size that slows your page download time. This is an easy mistake to make, but luckily it is fairly easy to fix. If you want to get stuck in and sort your images out then GTmetrix have a good guide on how to optimise your images. Web servers can be slowed down by image file size as we know. So using a simple compression plugin can strip out hidden bulky information and create smaller images that speed up your website load time. There are numerous plugins that can help compress your images. Some of the best include EWWW Image Optimiser, ShortPixel Image Optimizer and WP Smush. In this example we” use Smush – which is the one I like to use. 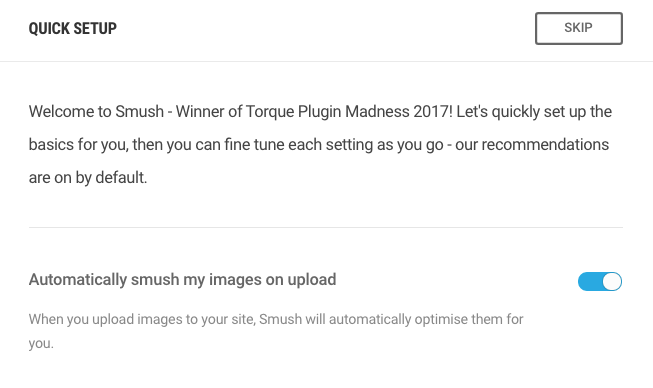 Access the plugin settings and ensure “Auto-Smush Images on Upload” is checked. This makes sure that any new images you add to your site will be optimised – Bosh! But before you leave, smush any existing images in your media library by clicking the “Bulk smush Now” button. You can only do this for 50 images at a time with the free version of the plugin. If you have many images, you’ll need to refresh the page once the first 50 have been done. Why do I need this you may ask. A cache is part of a computer’s memory (RAM/CPU) that stores recent information. When you visit a website that has a cached page, that information is stored on your computer’s hard drive. So every time you revisit that page it loads quickly. Therefore, by using a cache plugin, it creates static files so your site no longer has to render pages again and again. This speeds up your site for visitors which is a good thing. In this example we’ll use WP Fastest Cache. Once loaded go to the settings page and start checking the boxes as shown below. When you check the “create the cache of all the site automatically” box you’ll get a popup box. After all the items have been checked as per the example, click the “Submit“ bottom. When you make any changes to your site such as adding a new plugin or modify the theme/CSS, it’s a good idea to delete the cache so your visitors get the latest version of your site loaded. Step 7 – Analyse your site again. Like what? Hopefully the changes you have now made will have improved your WordPress performance speed. If the results are still not in the green, then look at the individual elements. GTmetrix provides a brief explanation of what the issue is and how to fix it in each case. You could also check out my other article on WordPress site optimisation for more tips. Analyse your site again to check if things are fixed. 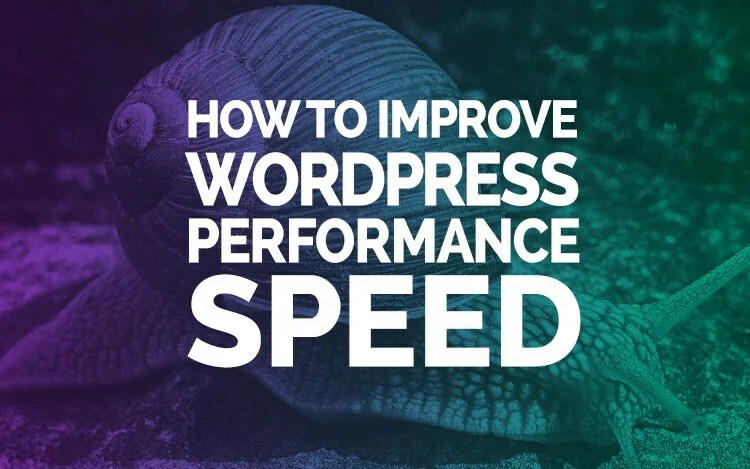 If you enjoyed this article on How To Improve WordPress Site Performance Speed, please share.